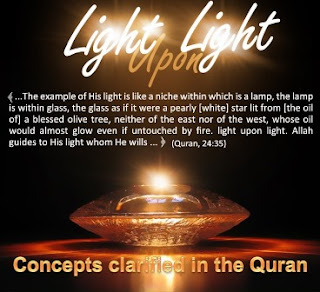 The role of the Quran in shaping the Muslim personality: The treasures of the Quran are hidden and buried as far as many Muslims are concerned, as they have not yet discovered these precious treasures that Allah has placed in it. Besides the fact that a Muslim is rewarded for reciting the Quran and applying its rulings, it is also the case that the Quran explains and clarifies the correct way to understand many concepts that people have misperceived or misinterpreted. For example, it expounds upon the reality of the concept of loyalty and disavowal, the concept of worship, the concept of the conflict between the truth and falsehood, and many other concepts which all Muslims must correctly understand and realise. The great treasures in the Quran: Some people seek to attain the reward of reciting the Quran, others memorise its verses in order to attain the reward of such memorisation, while others recite it to taste the sweetness that the soul feels during this. There are others who recite it in order to search for the lofty manners it calls the people to possess, and yet others who recite the Quran in order to find therein solutions to their social or economic problems. These are all important matters and one must seek to attain all the abovementioned goals and many more, but what is more important than that is for one to recite it in order to extract the great principles that mould the individual’s character and aid in correctly nurturing him. Many people recite the Quran hastily, or pass over its verses quickly without pondering over their meaning. The Quran is of great importance due to many more reasons than those we mentioned above, and which the Muslims must realise and have clear in their minds. I will try to highlight in this sermon some of these concepts that are instilled in the Quran, so that perhaps we may realise the importance of pondering upon the Quran. The concept of worship and seeking assistance: If one ponders over the saying of Allah (which means): “It is You we worship and You we ask for assistance.” [Quran 1: 5] He will realise that it means that worship and seeking assistance are exclusively for Allah, and this is the real essence of servitude to Allah. One must wonder when he recites this verse, which we do more than seventeen times daily, why worship is designated solely to Allah, and likewise seeking assistance. This concept must be clear in our minds: that only Allah is to be worshipped; not wealth, not position, not other people, not man-made laws, or anything else. We must submit our wills solely to Allah and humble ourselves only to Him. Also, we must seek only His assistance as a sign of perfect servitude because regardless of how powerful human forces are, they remain very limited, while the power of Allah is ultimate and unlimited as He is the All-Powerful and the Irresistible. The concept of abiding by the commands of Allah and hastening to fulfil them: The Quran emphasises on the great importance and the compulsion of adhering to the commands of Allah and not transgressing or disobeying His command. The Jews were commanded by Allah to prostrate, as Allah Says (what means): “…And enter the gate bowing humbly…” [Quran 2: 58] What did they do instead of adhering to this command? They entered on their buttocks and therefore opposed the command of Allah. Therefore, anyone who tries to alter the commands of Allah and applies what his desires are dictating to him resembles these people. Furthermore, one must hasten in fulfilling the commands of Allah and not act like the Jews did when Allah commanded them to slaughter a cow; they kept asking for finer details regarding the type of cow to slaughter while slaughtering any cow would have done. Many Muslims follow in the footsteps of these deviants by inventing obstacles that would cause them to not fulfil certain commands that do not happen to coincide with their desires, and this is nothing but following the whispers of Satan. The concept of being distinct in worship: Muslims must be distinct and not resemble the disbelievers in any of their acts of worship or religious rites. In the early stages of Islam, the Muslims would direct themselves towards Al-Aqsa mosque in Jerusalem in prayer, but they were later commanded to direct themselves towards the Ka’bah in Makkah in order to differ from the disbelievers. It is very important for us to know this rule of how people are measured according to the scale of Allah. How do people become loftier than others? How does one possess a higher rank than others? What are the criteria used to judge this issue? The Quran establishes that no worldly matter is of any effect in this regard and that it is solely based on matters related to the religion of Allah. When Allah favoured Taloot may Allah exalt his mention and chose him to rule over the children of Israel, they objected and judged the matter with a worldly scale: they protested that he was not rich, as Allah informs us when He Says (what means): “…They said: 'How can he have kingship over us while we are more worthy of kingship than him and he has not been given any measure of wealth? '...” [Quran 2: 247] But Allah immediately highlights the correct criteria of judging in the very same verse, saying (what means): “He said: 'Indeed, Allah has chosen him over you and has increased him abundantly in knowledge and stature…'” [Quran 2: 247] Therefore, knowledge and a strong body that enabled him to fight the enemies of Allah are what made him deserving of this rank, and both these qualities are matters that are connected to the religion: one is knowledge regarding it, while the other is the ability to defend and proliferate it.